Mario is a service coordinator with California Closets, and a recent recipient of a FirstService Relief Fund grant. Mario is sharing his story in the hopes that it will encourage others facing challenging times to consider applying for a grant and to inspire fellow FirstService-company colleagues to donate to the Fund. Each year, Mario and his siblings spend the holidays with their father, a talented sketch artist, known for his ability to translate his drawings into intricately detailed tattoos. This past Thanksgiving, the siblings went to visit their father, only to find that he wasn’t home. Free-spirited, and with a sense of wanderlust, it wasn’t uncommon for him to go on a spontaneous trip somewhere – sometimes for a few months at a time. He would return and share with his children stories of his travels and the places he’d seen. Initially, the siblings weren’t particularly worried about their dad, but, as time passed and they still hadn’t heard from him, they grew increasingly concerned that something wasn’t right. In February of this year, the family got the call they had hoped to never receive. Their father’s body had been located in Southern California, over eight hours from Mario’s home. Authorities believe he had passed away in November, which is when the family first began looking for him. 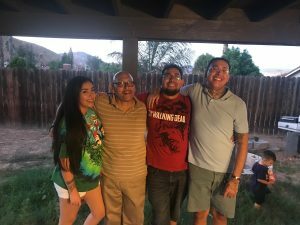 Mario drove through the night to meet his siblings, and began the difficult process of meeting with the coroner, retrieving his father’s possessions and planning his funeral. For many families, the expenses associated with funeral arrangements can be overwhelming, requiring them to exhaust their savings and even take out loans to help cover costs. In Mario’s case, money he had been saving for his wedding instead went toward funeral expenses. Mario was reminded of the FirstService Relief fund by one of his co-workers who encouraged him to apply for a grant. His expectations were low. He didn’t expect anything to come of his application, so he put it off. After some gentle reminders and prodding, he submitted an application for a grant. Every dollar contributed to the Fund allows us to help employees facing personal hardship. There are several ways to contribute, including automatic payroll deductions, text-to-give, and one-time or recurring donations. For more information on the Fund, please visit firstservicerelief.com.